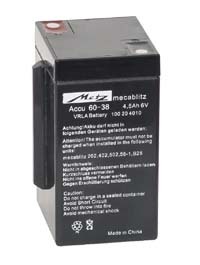 Metz brand replacement dryfit battery for Metz Mecablitz 60 CT flash units. If you can't remember how old your dryfit battery is, it's probably close to the point of needing replacement. There's a simple way to check the date of manufacture. Look for a four digit code embossed on the bottom. The last two digits are the year of manufacture and the first two are the week of that year. If your battery is more than 5 or 6 years old, you should consider getting a backup before your old one fails.